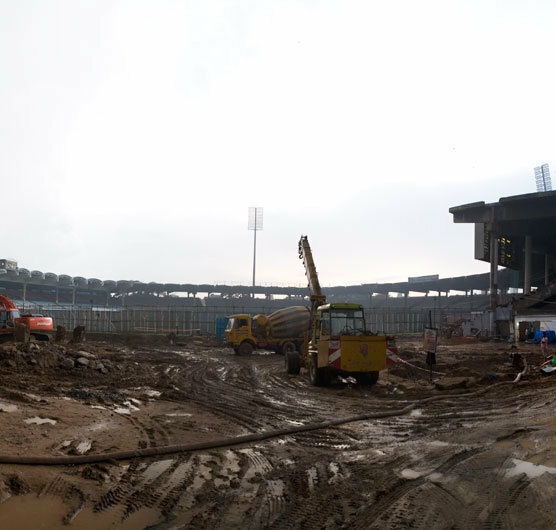 Construction has started on the first phase of the new Cricket Stadium at Chepauk in Chennai. Three stands on the eastern edge of the site have now been demolished and piling has commenced, signalling a new chapter in the development of this historic ground. The first of four phases which will see the complete re-construction of the Chidambaram Stadium by mid-2011, comprises three new reinforced concrete stands accommodating 10,000 spectators and 24 hospitality boxes under translucent PTFE membrane roofs. When finally built out, the 43,000 seat stadium will help to bring back the "swing" for which Chennai is so famous, and the sporting chances it brings to the game.